Get One Vileda Virobi Robotic Mop with Another One for Free! May redeem multiple coupons per person. Coupons must be redeemed within one month of purchase. Delivery option available for an extra $3 charge (delivery takes 3 to 4 business days). Non-Refundable / No carry over. VAT included in price. Standard terms & conditions apply. Should a product purchased through our website arrive defected, you have 3 business days to return the item back to our office for an exchange. The item must be unused, in its original box, and with all paperwork, parts and accessories. You don't have to spend most of your time doing those never-ending house chores! With today's deal we've got someone to do it for you! 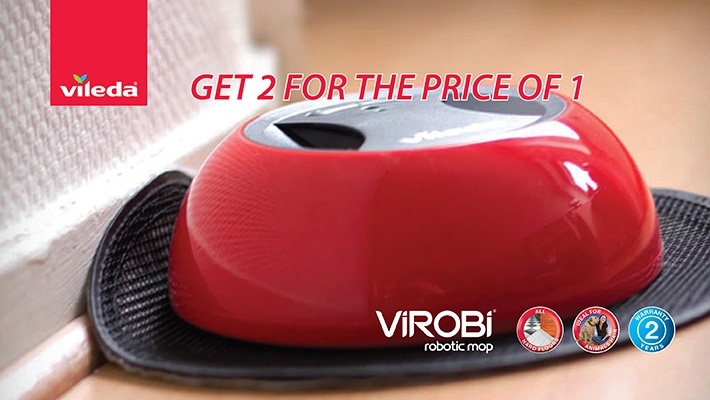 Buy one Vileda Virobi Robotic Mop and get another one for FREE for only $54 instead of $60. Vileda by Freudenberg is distributed in Lebanon by Khalil Fattal & Sons, household and personal care since more than 40 years. Top quality, innovation, efficiency, durability and value for money are the hallmarks of Vileda’s time-saving household helpers.